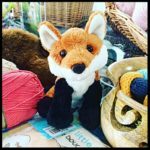 News & Notes – the Red Fox Yarns Blog! At the beginning of next month, Red Fox Yarns will be two years old! It truly doesn’t seem that it’s been that long thanks to my wonderful, supportive customers. This year promises to bring back some favorite classes, add some new classes and fabulous new yarn… and who knows what else? Thank you so much for joining me on this adventure! !